Tired of constantly fiddling with those points? The PAZON SURE-FIRE Ignition System is the worry-free solution to keeping your classic bike on the road. What motorcycles does it fit? & points in the side casing. For Norton Jubilee/Electra/Navigator, see kit PA2L-6. This system is not recommended for Energy Transfer (ET) models, as the ET system can be problematic. For stable and reliable electrics, where possible we recommend upgrading the ET system to 12 volts (new alternator and electronic rectifier/regulator) and installing a 12 volt ignition system. For models fitted with a distributor (e.g. 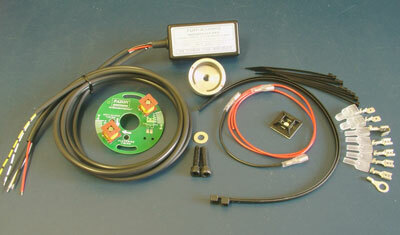 Triumph 3TA/5TA), we recommend fitting our Energy Booster ignition unit. SURE-FIRE completely replaces the points, condensers and mechanical advance unit (ATU). The result is easier starting, smoother running and less maintenance. "My bike now runs like a dream"
Andy, ignition unit arrived a couple of days ago. All in good condition, thanks for the prompt delivery. To mount the rotor I made a new flywheel nut with a taper to match, the trigger unit is mounted on a piece of phenolic sheet with a rebate machined so the disc can be rotated without losing lateral location. All firing thru the original Triumph coils. I had to mount the unit on the crank as the old points location is taken up with a new hi flo oil pump system I installed. Your ignition unit works like a dream, as does the solid state rectifier, constant 7.2 volts at the battery. Very happy with everything from Pazon and the service I got, thanks again. Fitted the unit and bike started 2nd kick, very impressed with the whole unit, ease of set up, great instructions and the quality of the product and the service I have recieved from Pazon. These are a thing of the past with the SURE-FIRE trigger assembly. The quality double-sided printed circuit pickup features degree calibration marks for precise timing adjustment. Your choice of terminal block or solder pad connections. Precision engineered aluminium rotor with small powerful submerged button magnets - no screws to foul the pickup, as associated with other systems. Have you ever fitted an ignition system where the wires don't reach? SURE-FIRE has extra long wires from the ignition module - 1metre long, allows the unit to be fitted almost anywhere. SURE-FIRE does not have the connection problems associated with other systems, the wires run directly from the module to the pickup. All you need is a small screwdriver to make these connections. Are you worried that the ignition will be bulky and difficult to hide? The SURE-FIRE ignition module is compact (80mm x 40mm x 20mm) and light. Every SURE-FIRE system includes a comprehensive full colour installation booklet to guide you through, with easy-to-read, detailed instructions, photos, wiring diagrams and advance curves.